Hosting a pop-up shop is a growing retail trend, and an ideal approach to reaching a wider audience and increasing footfall to your retail business. With brick and mortar stores your business can be limited in obtaining those customers who might not usually come across your store. Pop-up shops can make your business mobile, increase brand awareness, whilst keeping your brand fresh and current. Be the fresh-faced store in town and attract the trend-driven Gen Z market. It’s important to always be working on increasing your brand awareness, with the aim of consumers being more familiarised with your image, qualities, goods and services. A pop-up can create hype and excitement, with a well-planned out marketing campaign, your pop-up can be the new kid on the block. 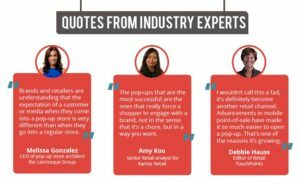 Research the latest retail trends, look on social media and implement them at your pop-up. Customers are drawn to limited availability if your store is only there for a short period of time, you can roll-up those customers who will miss you when you’re gone. By having a pop-up you can give your stagnant brick and mortar store, legs (sort of)! By moving about, you can increase your reach and bring your brand to your customers, instead of the other way around. A pop-up is a great way to offer customers more than just a chance to buy something, it is a chance for you to get to know your customers and offer them an experience – offer a personal shopping experience or a chance to win a competition. 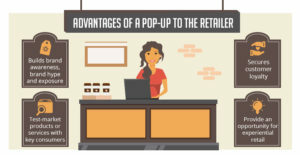 A pop-up doesn’t have to be a replica of your store, it can be a chance to market research new products or ideas and gain some feedback from those who matter most. 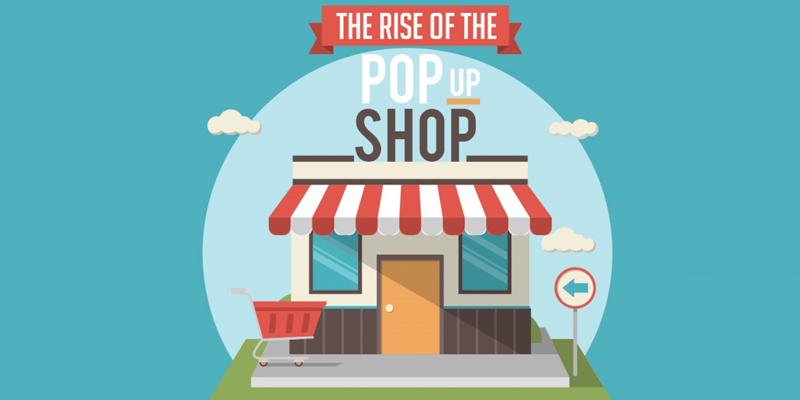 And although there are many benefits to independent retailers doing a pop-up shop, it has also become increasingly prevalent with big name brands and pureplay ecommerce shops. A store within a store is often quite popular, collaborating with companies that may compliment their own and also share increasing rent prices (which is a big bonus!) For example, fashion retailer Next has a Costa Coffee café within some of their stores, providing a chance for shoppers to take a break with some refreshments, without having to leave the store! Sainsburys, which acquired Argos in 2016, now has concessions of the ‘digital retailer’ within 250 of its supermarkets. This has proved beneficial to both parties as visitors to Argos often pick up a few items in Sainsburys, meaning that the Home Retail Group are able to keep up with the competition coming from the US in the shape of Amazon. Amazon recently launched a pop-up shop in central London to seek shoppers’ views on its own clothing ranges, prices and store experience by handing out questionnaires to shoppers in store to gauge their response. As well as a store within a store, there are many other different types of pop-up shops that you can try, based on your logistics, budget and planning. Pop-up types include, a kiosk or booth, which have quite a low-cost set-up and are usually located in high footfall areas. Pop-up or general vacant space, can be beneficial as you’ll be dealing with space owners who understand the whole pop-up concept. In-line shopping centre stores, where you will benefit from the existing footfall in the shopping centre. And vacant street level space, which means that being on street level means you’re again open to existing regular footfall. If you’re considering having a pop-up it can be difficult to know what retail technology will help you to manage transactions and feed information back to your base. A mobile EPoS system that is cloud hosted providing real time data and results could be the answer. For example, British Red Cross used Cybertill’s cloud-based EPoS system to manage its pop-up store in Westfield, London.